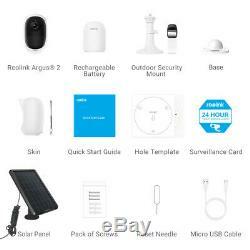 Reolink Argus 2 100% Wire-Free 1080P Rechargeable Battery Powered WiFi Wireless Security IP Camera IP65 Weatherproof Outdoor with Reolink Solar Panel. 100% Wireless Outdoor Rechargeable Battery IP Camera. Video Quality: 2 Megapixels 1080p (19201080). Lens: f=3.26mm Fixed, F=2.2, With IRCUT. Audio: 2-way Audio, Listen & Talk. Frame Rate: up to 15fps. Network: 802.11b/g/n, WiFi 2.4GHz. Storage: Support Micro SD card slot (Without built-in SD card). Network: P2P and QR Code. 100% Wire-Free, Place It Anywhere Freely. The wifi surveillance camera is perfect to use when you are tiring of drilling holes or wiring. Setup process has never been so easy with innovative setup design! With a magnetic swivel base, you can just stick Reolink Argus 2 on it and twist it in any directions. No cords, no wiring and no worries --- thats the way 100% wire-free should be! Rechargeable Battery, Save Continuous Battery Cost. Reolink Argus Pro works with a rechargeable battery. The battery can be charged 500 times from empty to full. And can use 8 hours at work, including remote access and sd card motion triggered recording. This really saves much cost on a battery camera. 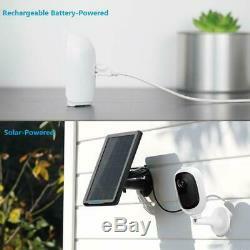 Continuously Power Charging by Reolink Solar Panel (INCLUDED). 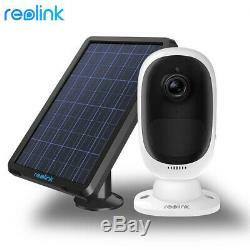 The rechargeable battery IP wifi camera can work continuously without taking the battery off for charging by reolink solar panel outside. Or you may take off the battery and charge it by 5V power adapter commonly used on your mobile phones. 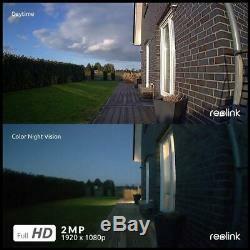 The Reolink Solar panel can work with both Argus 2 and Argus Pro surveillance HD camera. Each Solar Panel can work with one camera. 1080p Full HD, Crystal-Clear View. 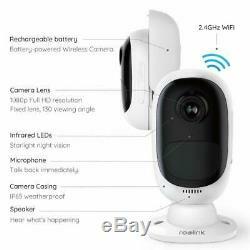 Reolink Argus 2 security IP camera captures exceptionally crisp 1080p HD images, sharper and clearer than those of 720p wifi cameras; meanwhile, this baby camera is more suitable for indoor and outdoor use for a wide view angle 130 degrees. It is much better in view image quality and angle for your security purpose. 1080p Full HD & Starlight Night Vision. See everything in details with true 1080p Full HD. Get clearer and sharper images/videos than 720p cameras. With the advanced starlight technology 2 Megapixels CMOS Sensor, Reolink Argus® 2 gives you high-quality videos in very low light conditions from full daylight to starlight (up to 33 feet night vision) , without the extra lighting infrastructure. And you can see valuable visual details to identify people, vehicles, and other objects around the clock. Weatherproof Casing Design for Outdoor Use. 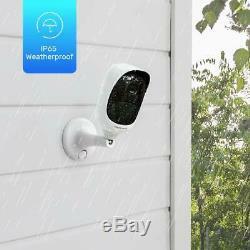 The weatherproof design offers you almost no limited placement! You can place Reolink Argus 2 wire-free security camera on a shelf or other flat surfaces, in babys room, pets room, garage, on a tree, etc. Or mount the camera to the wall, inside or out. Working with Reolink Solar Panel, it can work continuously not taking off for battery change or recharging, it can work perfectly in sunshine seasons. PIR Motion Sensor, Instant & Accurate Alerts. 130° wide-angle and highly sensitive PIR motion sensor offers almost no false alarms. No human movement can slip through without your notice. Reolink Argus 2 battery-operated security camera will be woken up at once when you access the camera for live streaming or when motion events are detected. You will get rid of worrying about the rain or snow false alarm all day long. Two-Way Audio, Hear &Talk Back via Your Smartphones. Hear what's going on inside/outside your home and talk back just with a touch! With built-in microphone and speaker, you can communicate with your elders, kids, babysitters, pets, etc. Wherever you are, making you feel your beloveds are always in your sight. Remote Viewing, Anytime, from Anywhere. Control has never been so easy with free Reolink App and Client! View your family and home anywhere and anytime via your iOS and Android smartphones, or through a Windows or Mac computer! Even when you are in your office or travelling, you can check whats happening to your home/business on the go! Q: Is the solar panel inside the package? Q: Is the battery rechargeable? A: Yes, the battery is rechargeable. Q: Is there power adapter in the accessory? A: No, but it comes with the power cable. Q: Can it work during power charge? A: Yes, but if charging by power adapter, we have to take the battery off and charge. 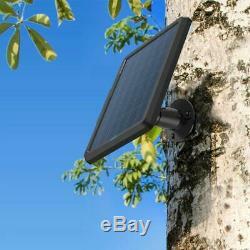 Or if you install under sunshine, you may use the camera with Reolink Solar Panel for power charging. Q: How long does the battery last when in full charge? And it will standby when there is nothing to trigger the infrared motion sensor or no one remote access it. The battery normally can support 180 days standby, or 840 min. Working time (depends on various environment). Do Not support 24/7 recording. 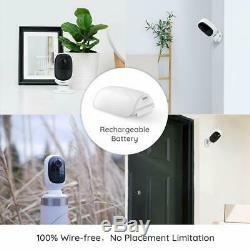 The item "Reolink 1080P Wire-free Security Battery Camera Outdoor Argus 2 with Solar Power" is in sale since Tuesday, July 10, 2018. This item is in the category "Consumer Electronics\Surveillance & Smart Home Electronics\Home Surveillance\Security Cameras". The seller is "reolinkonline" and is located in Walton, Kentucky.